April 14/09 11:41 am - Bikes+Transit.com's "TwitterFlickrFest"
Bikes+Transit.com is pleased to announce the first ever "twitterflickrfest". 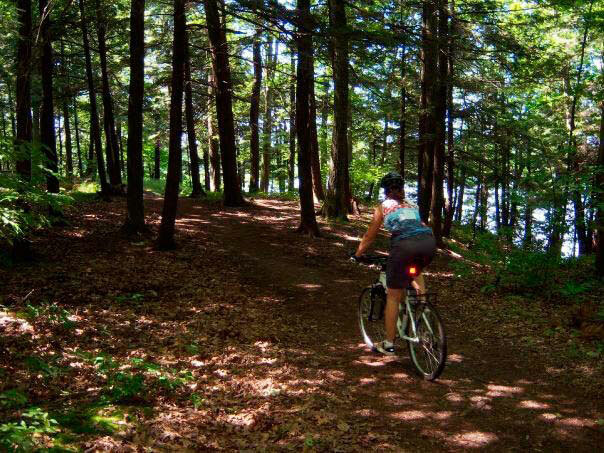 From June 13 to July 13, adventurous GTA cyclists are encouraged to participate and help make bicycle and transit travel around the Golden Horseshoe a more popular past time and permanent green mode of transportation. "Last year's GO-by-Bike to Ajax pilot project showed us," says local cycling and transit advocate Donald Wiedman, "that transit and trail riding makes for a great daytrip, a 'super-natural' day to be exact. But it was tough to get casual riders out to try something they've never thought of doing before." "So this year we're asking all adventurous types on two wheels to lead the way to changing our local tourism perceptions, and 'test ride' the bikes routes and transit modes that will be featured in detail from July 13 to September 13 on www.bikesandtransit.com." Tweet on the ride and send photos from your cell phone, or tweet and email pictures after you get home. Show everyone how easy, wonderful, and inexpensive it is to use transit to reach municipal bikeways, the Waterfront Trail, Trans Canada Trail and our beautiful lakefront and green spaces from Whitby to Burlington, Grimsby to Guelph, and back. Except during rush hour! Judging the tweets and photos after the month-long "twitterflickrfest" will be Toronto Mayor David Miller, past Giller Prize nominees and acclaimed Canadian authors Nino Ricci and Paul Quarrington, Donald Wiedman and local cycling advocate and webmaster "Biking Toronto Joe" Travers of BikingToronto.com. • Main Street TTC subway or Danforth GO train station south (bike route #59) to The Beach, west to Leslie Street Spit and Cherry Beach, and home via Union Station. • Union Station (TTC & GO) to Toronto Islands via the Island ferry. • TTC subway to High Park (High Park station), Humber Valley (Old Mill and Jane stations) or Don Valley (Broadview station). • GO Train to Aldershot, Burlington bikeway and Trans Canada Trail to Hamilton Harbour and Cootes Paradise. • GO Train to Burlington to waterfront and Waterfront Trail to Hamilton's Confederation Park, return via Burlington bikeway to Appleby station. • GO Train to Ajax, Trans Canada Trail south and Waterfront Trail east to Whitby. • GO Train to Guildwood, Highland Creek bikeway north and south to Waterfront Trail, east to the Rouge River and Pickering waterfront and GO Station. • GO Train to Mimico and Waterfront Trail east past Exhibition Place to Union Station. • GO Bus (with bike rack) to Aberfoyle, on road greenbelt ride south to the Burlington GO Station. • Canada Coach (with bike bag) to Grimsby, on road south to the escarpment, west to the Trans Canada Trail, north along the Waterfront Trail, return via Burlington GO Station. From June 13 to July 13, tweets using the hashtag #biketrans on Twitter, and photos sent by cell phone or email to fest@bikesandtransit.com will be eligible. Prizes will go to the best overall tweet, most literary tweet, funniest tweet, furthest tweet (geographic distance from home), and best photo. Tweets will be re-tweeted during the fest on www.twitter.com/bikesandtransit. All appropriate photos entered will be posted on a Bikes+Transit Flickr page. On May 13, more 'fest' route details, including online self-serve Waterfront Trail and Trans Canada Trail maps, will be available at Bikes+Transit.com. Riders will also be able to purchase a packet of five cycling maps covering: Durham, Toronto, Burlington, Hamilton and West Niagara. Profits from the sale of cycling map packets will go to the Ontario Lung Association. Bikes+Transit.com is brought to you to-date by: Metroland Media Group, Bombardier Transportation, BA Consulting Group, Saxe Enviro Law and Mountain Equipment Co-op. Bikes+Transit.com - "Get right on it!"